Principal Photography for the sequel to last summer's box-office hit Transformers has wrapped as of last week. We all know (well, some of us know) there were problems with the first film. I think Revenge of the Fallen is a huge test for Michael Bay to see if he can correct all of those mistakes and do this sequel justice. 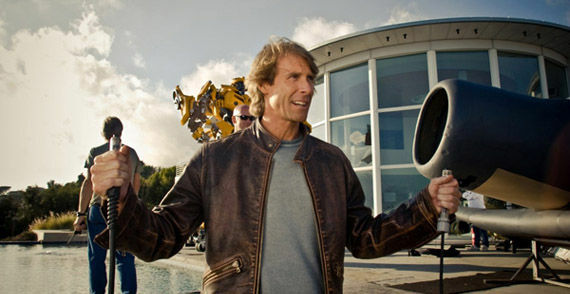 During the writer's strike, Michael Bay took it upon himself to write much of the script so they could make the June release deadline next summer. This way, when the strike ended, he had something prepared already for the writers to work from. What this means is that this whole film is entirely Bay's baby. The story, characters, bots and action sequences are mostly on him. So we'll see how this film compares to the first and whether or not the problems of the first film still exist, are fixed, or get worse with the sequel because then we'll know who to blame. Many people make fun of Bay, but the guy is crazy talented and I for one really enjoy a lot of his prior movies (the Bad Boys franchise, The Rock, The Island, Armageddon, etc.). Yes, they all feature a very large truck in some sort of chase scene (even the vehicles on the meteor in Armageddon - no matter what, he finds a way to do it) and yep, there are explosions everywhere. But that stuff works on screen for big summer flicks and I'm keeping hope for the sequel. There is so much potential for this film to be amazing and I really hope Bay pulls it off. Bring on the explosions baby! Now for some possible spoilers about Devastator and the new female lead played by Isabel Lucas. I repeat: SPOILERS. So if you don't want to be SPOILED, this is where you stop reading. Transformers World 2005 has picked up on two possible spoilers for Revenge of the Fallen. First we have a report confirming that Isabel Lucas' new character, Alice, is a Pretender. Pretenders originated as a line of Transformers toys in the late 80s that were able to disguise themselves in organic forms. In the film, Alice's disguise is that of an attractive woman with a robot mode similar to that of Frenzy from the first film (the worst robot in the movie). The report also details that the character will have an arm that can transform into an energy weapon, a long tongue and a tentacle for scanning. Uhhh... why is any of this in the movie? I thought we were going to focus on more of the big transformers and story this time. Maybe it's just because this is the first report on this, but this sounds incredibly ridiculous to me at the moment. I hope so much that this is just misinformation; I have no interest in undercover human-disguised robots. This doesn't sound like a good way to improve on the mistakes of the first film, and I don't think this is what fans meant when they asked for a more robot-centric movie. Next we have a more exciting spoiler, this time on something I think most fans want to see in the film: Devastator (this is NOT an official image from the film). Each component apparently has its own robot mode except for the Truss Crane. I hope that's the case only for the toys because every part should be a Transformer on its own in the film. Screen Rant is known for its negative feelings towards the Transformers movie - some of our writers hated it. Luckily, I joined the site after the movie came out and its hype had died down a bit because I wasn't as much of a hater of the first film. When I first saw Transformers in theaters, I was blown away by the action sequences as most were and really dug the designs of the bots (except for Frenzy who really brought the film down for me with all his/its scenes). It wasn't all positive though, I almost couldn't handle how bad some of the characters were and how a few of the scenes played out. The most notable problem for me was Agent Simmons, played by John Turturro. Without exaggerating, watching his character in theaters was excruciating. He was for me, the single worst character from any film or television show I have ever seen in my life... ever. It hurts my brain to think about it now as I write this. I have never seen such stupid dialogue or characterization before - but we should probably move on from this. Other problematic characters included John Voight's and Rachael Taylor's who were very unbelievable in their roles and were poorly cast in my opinion. For the most part, I dug the rest of the cast. I have read a lot of negative feedback on the Witwicky Parents and Anthony Anderson's character but I actually enjoyed them and they worked for me on screen. That donut scene with Anderson's character (Glen Whitmann) was hilarious. Also, that scene where his cousin runs from the cops and crashes through the glass when their house is raided made me laugh too. As for some of the specific scenes that were problematic for me; the obvious one is Barricade chasing the Autobots on the highway, Sam Witwicky (played by Shia LaBeouf) pointing him out... then... the vehicle vanishing? What? Where did it go? He was there... and then he wasn't? I don't get it. I'm not sure that even counts as a plot hole... more like a segment of the film missing. And of course there's the final city battle which for the most part was awesome, except for Optimus being useless. What happened to that sword in your arm buddy? It worked pretty well on Bonecrusher when you ripped his head off. But hey, maybe he can only use it once a day or something. Now to tell you how I really feel - Just kidding. Transformers: Revenge of the Fallen hits theatres June 26th 2009.